Being an entrepreneur is a mindset. To become one of them, you need just one thing – to think like an entrepreneur. But this is not that easy, and if you want to achieve it, you first need a plan and then to be consistent. You have to start thinking differently than most of the people. You should not avoid problems, you should face them; you should not listen to people who will say that you will fail, you need to believe in your success. You will have to take risks, instead of avoiding such… These and many other states of mind are what makes entrepreneurs different from the ordinary people. There are many different factors that are involved, but I think one can master all of them. Where to start? Well, below is a good suggestion for that. This infographic is created by the startup consulting company FoundersandFounders, and on it, they suggest the first things you should change in your behavior if you want to become an entrepreneur. Be not scared, have simple and problem-solving thinking and don’t listen to people, who say you can’t do it. 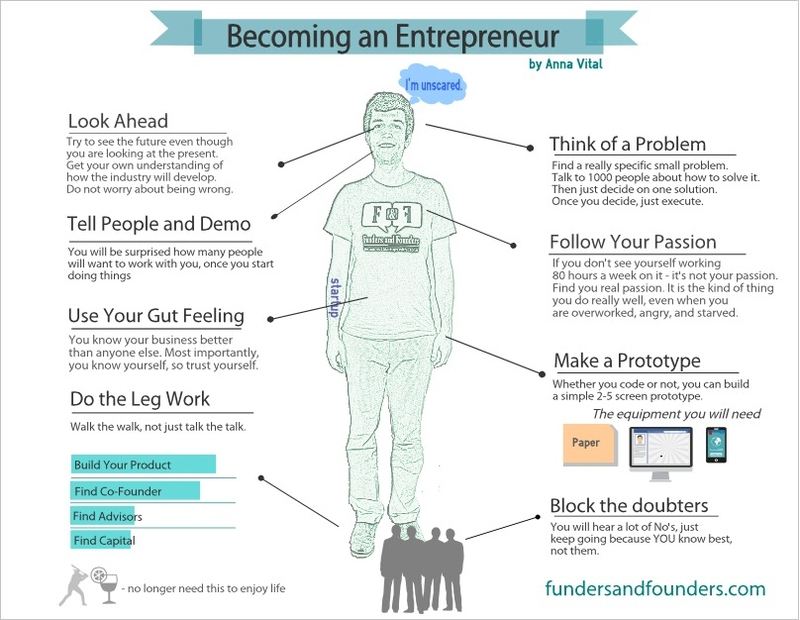 These are the first steps to becoming an entrepreneur. Although some are just born this way, this doesn’t mean that the others can’t achieve it. Anyone can become an entrepreneur, you just need to learn how. I hope, this article helped you a little. Browse our site for some more cool and great ideas and advice. It’s entirely dedicated to topics like starting up and entrepreneurship. If you enjoyed this article, please don’t be scared to share it on your favorite social sites, too. This way you will support our site and will help us make more cool posts like this one.